The Winix WAC9500 Ultimate air purifier is a top-end air purifier with excellent performance. Those who’ve tried the WAC9500 air purifier know it is superior to other models they’ve tried. This unit is intended to be a step up from those cheap, poorly constructed models made by other companies that make a lot of noise but don’t clean a lot of air. It is the ultimate air purifier with a latest PlasmaWave technology. Most airborne particles are not possible to see. Winix WAC9500 removes all airborne pollutants as small as 0.3 microns using True HEPA filter. As it comes with a washable carbon filter, you will not have to worry about replacement for a long time. It doesn’t only remove particles from the air, but it also removes any unwanted odors like smoke or cooking odors. Anti-microbial filter, which is also included, catches larger particles. That keeps the carbon filter protected and extends the life of the purifier. Optimal setting controls are automatically adjusted because Winix WAC9500 purifier uses Smart Sensors to detect the level of allergens or dust in your household. You don’t have to worry about anything. The primary functionality of the Winix Plasmawave 9500 comes from its five-stage cleaning process. As the unit intakes air from the surrounding environment, it pushes it through a bacteria-killing pre-filter. The first stage catches cat hair and other larger objects, so they don’t clog the inside of the filter. This allows the HEPA filter to last for up to a year or more. The next stage of the process is a 99.99 percent effective HEPA filter, which removes particles as small as 0.3 microns. This stage of the cleaning process is one of the reasons that this unit is an excellent air purifier for pet owners. It removes pet dander from circulation, which can ease the symptoms of allergies in sensitive individuals. The HEPA filter also removes smoke particles, dust, and other microscopic pollutants. Winix WAC9500 removes any micro-dust, smoke, soot, mold spores and pollen. It is the ultimate air purifier with a latest PlasmaWave technology. The air then undergoes anti-microbial treatment to combat viruses and other pathogens before passing through to the Advanced Odor Control (AOC) stage. The odor filter can be removed and washed by hand. It is made from coconut shells and is one of the reasons why Winix WAC9500 Plasmawave purifier is considered to be among the best air purifiers for odor filtering. It effectively removes smells caused by pets as well as common household odors, like ammonia. The final stage of the five-step cleaning process finishes with PlasmaWave technology. The Winix 9500 Ultimate pet air cleaner releases ions that connect with pollutant particles, which pulls them out of the air and breaks them up. Unlike some other air purifiers, it does not release any ozone into your home during the process. Winix 9500 air purifier might not be the best-looking air purifier in the market especially compared with Winix own Signature and FresHome Series. It is short in width with a long depth at 22.6 cm in width, 55.6 cm in height and 41.9 cm in-depth. It weighs 8.5 kg which makes him easy to carry. Although a built-in caster would be a great help. The electronic display is located on the front panel as oppose to the usual top. Build quality is sturdy, and air intake is located on both sides of air purifier while air outtake is located at the top. Like most Winix air purifier, there are no other color options available (at least for now). Ideally, Winix WAC9500 purifier with plasmawave technology should be the best for all living rooms. But due to the moderate air purifying coverage at 26 m2 (284 ft2), it better suits to a small living rooms or bedrooms. With its 5-stage filtration cleaning, Winix WAC9500 CADR is rated at 182 cfm dust free, 194 cfm pollen free and 183 cfm smoke-free by the California Air Resources Board. We do not have the exact figures for the noise level, but Winix 9500 air cleaner is still relatively quiet with minor fan sound when running on maximum speed. Power consumption is low, at only 6 watts of power at low-speed and maximum of 70 watts at turbo speed. If you need an air purifier for larger rooms then maybe Austin Air Healthmate HM 400 is what you need. For smaller size rooms up to 110 sq ft, you could check Honeywell Platinum 16200 Air HEPA Air Purifier. As mentioned, Winix WAC9500 comes with 5 stage filtration cleaning. Those five steps include Nano Silver Anti-Microbial Treatment, 99.99% effective True HEPA, PlasmaWave Technology, Washable Anti-Bacterial Pre-Filter and Washable Advanced Odor Control Carbon. Great feature of the Winix model 9500 is the use of washable filters. After some time, depending on how much purifier has been used, you simply wash filters and they will be as good as new. Winix Replacement Carbon Filter size 21 fits PlasmaWave series models WAC5300, WAC5500, WAC6300, 5000, 5000b, 5300, 5500, 6300 and 9000. #1 True HEPA Filtration – Successfully captures 99.99% of airborne pollutants, pet dander and allergens as small as 0.3 microns. #2 Advanced Odor Control Carbon Filter – Uses granular coconut shell carbon that is made to absorb pet odors as well as cooking and other common household odors. Independent test results showed this enhanced carbon filter is 3 times more efficient at removing ammonia and other offensive odors than a standard disposable carbon filter. #3 Germ and Bacteria Protection – The outside of the carbon filter is coated with a nano silver anti-microbial shield in order to neutralize germs and bacteria on contact (pets can carry a broad range of germs and bacteria). 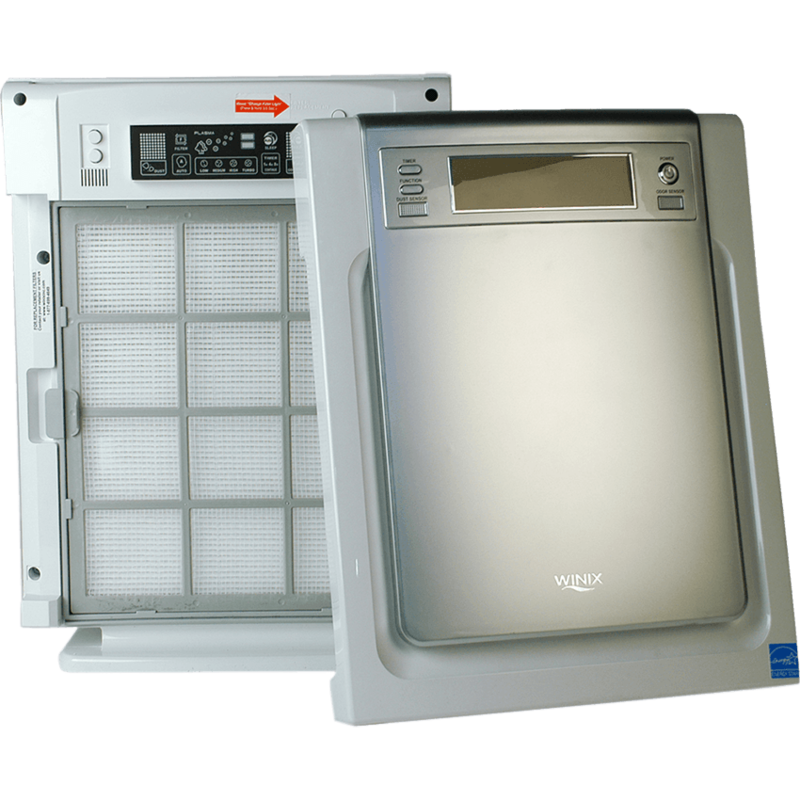 #4 Anti-Microbial Pre-filter – Extends the life of the HEPA filter by capturing larger airborne particles like pet hair, fur, dust and lint. #5 PlasmaWave Technology – Captures odors and pollutants on a molecular level in order to neutralize viruses, bacteria, chemical vapors, gases and odors without producing harmful ozone. #6 Smart Sensors with Auto-Mode – Odor, dust and light sensors automatically adjust the air purifier’s setting to comply with the needs of your indoor environment. #7 Sleep Mode and Auto-Sleep Mode – When Sleep Mode is active the air purifier will operate on the lowest fan speed for quiet operation. When Auto Sleep Mode is activated the air purifier will automatically enter sleep mode when the light sensor detects darkness and vice versa. #8 Timer – Can be set for 1, 4 or 8 hours if you only want air purifier to run for a certain amount of time. #9 Simple Operation – User-friendly digital display with electronic button controls and a remote control for easier managing tasks. #10 Energy Star-Qualified – Energy consumption at lowest speed setting should be around 6 watts and 70 watts on highest speed setting. #11 Easy Maintenance – This air purifier only has 1 filter cassette to replace. It has a filter change indicator to let you know when it is time for a new one. The filter is located behind the front grill of the air purifier, and no tools are required to change the filter. The pre-filter and carbon filter should be washed every three months. For owners who don’t want to micromanage their air purifier, the Winix WAC9500 pet air purifier offers various automated features that respond to changes in the environment. The unit is equipped with sensors that detect rising levels of vapors and pollutants and adjusts filtration settings accordingly. It also comes with a remote control. That means you can control it from the comfort of a couch or bed. There are four different fan speeds, which allow for finer control over the unit’s operations. The “Turbo” setting is ideal for unleashing the unit’s maximum purification potential, while “Quiet” mode allows the machine to operate silently as you sleep. Like other Winix air cleaners, the WAC9500 model is energy star qualified and is optimized to use energy efficiently. During our filtration test the Winix PlasmaWave 9500 Ultimate Pet true HEPA air purifier removed an average of 96.8% of all particles larger than 0.3 microns on the first pass of air through the filter. These test results were in line with reviewers claims of improved air quality in their homes. After running the Winix PlasmaWave 9500 Ultimate Pet HEPA Purifier in their home for a few days, buyers reported significant improvements with their allergy problems as well as less dust in their home. When operating on auto-mode the air purifier will speed up and slow down based on particles and odors it detects in the air. Buyers love knowing air purifier is monitoring air quality for them and were surprised by how sensitive it was to the slightest change in air quality such as the oven being turned on or an air freshener being sprayed. After only ten days of using this unit I can not find anything to complain about. When air quality is good the Winix WAC9500 Air Purifier runs on low fan speed and is very quiet. When the air quality goes bad air purifier will adjust to high fan speed which is quite a bit louder. Luckily, most of the time the Winix PlasmaWave 9500 rectifies the air quality issue quickly and will adjust back down to the quiet low fan speed. Some buyers say that the PlasmWave technology makes a quiet, but high pitch sound. Most customers stated that they ended up getting used to the sound, but there were a few who had to turn the Winix PlasmaWave function off to stop the sound. Others did not find the plasma wave sound to be an issue. The Winix 9500 Ultimate has one filter cassette that contains all of the filters. This filter cassette only needs to be replaced when filter change indicator notifies. It should last for about one year of constant operation under normal conditions. Buyers say it is easy to remove the front grill and change the filter in a matter of seconds. The manufacturer also recommends washing the pre-filter and carbon filter every three months and it is up to you to remember to do so. Winix WAC9500 Ultimate Air Purifier is great deal for the average person with general air quality concerns. 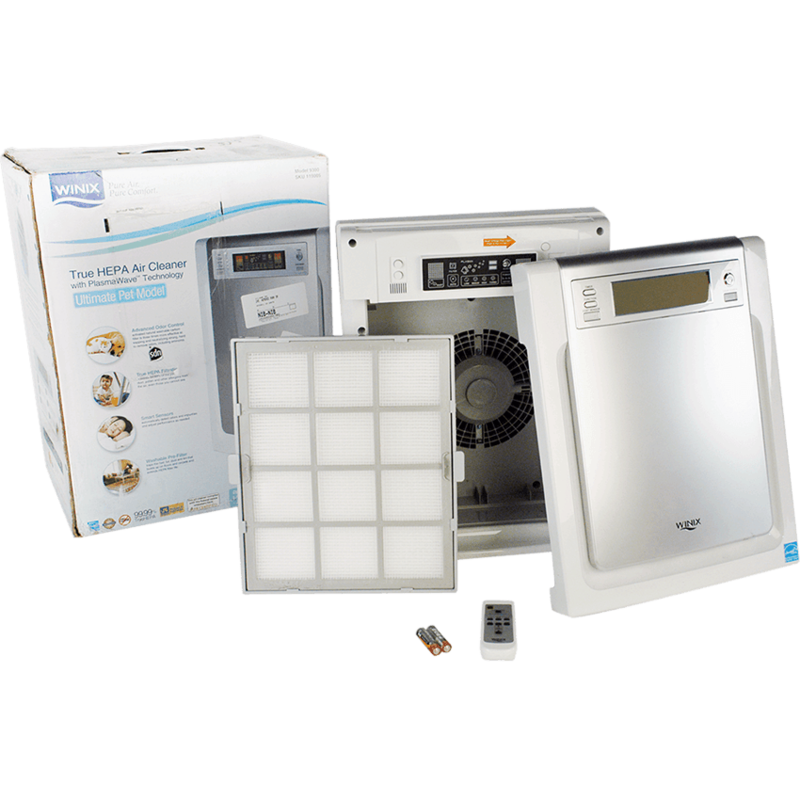 It is affordably priced, covers a good size room, removes airborne particles, addresses common household odor issues, offers ‘set it and leave it’ convenience. It is also quiet and requires minimal attention to maintaine. The Winix WAC9500 has a minimal amount of granular carbon media. This minimal amount of carbon paired with the PlasmaWave technology will address common household odor issues such as those caused by cooking, cleaning or a family pet. 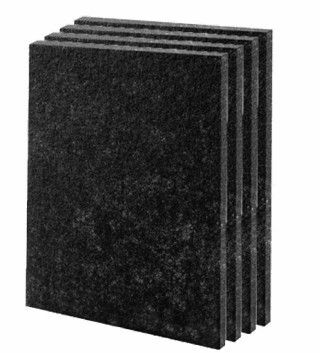 In order to seriously address an air quality issue caused by a significant amount of chemicals, gases or strong odors you need a filter that has a large amount of carbon (18 to 26 lbs) with a deep bed (2 to 3 inches thick) which provides a longer dwell time for better adsorption of gases, chemicals, or odors. This is not so much disadvantage as most household air purifiers are not built for chemical, gas or VOC removal. Winix mostly offers a 1 year limited warranty on the Winix PlasmaWave 9500 (depending in which country you bought it) . This is shorter than the average manufacturer’s warranty on a product of this quality. It should be at least three years. Usually, additional 1 or 2 years of protection can be bought for $16.99 to $19.99. But still, why pay extra protection when it should be included in the first place. Despite its one year limited warranty, we feel you can be confident this air purifier will last much longer. Should You Buy Winix WAC9500? Winix Ultimate air purifier with PlasmaWave technology model 9500 is a significant step up from many other air cleaners and is surely one of the best pet dander air purifiers on the market. Households with pets have dirty air unless you take action to clean it up. With the Winix WAC9500, you’re taking as much action as you possibly can. And you’re getting results that are better than you thought possible. While the Winix WAC9500 offers a powerful arsenal of features to customers. The Winix WAC9500 Ultimate is a top-end air purifier with excellent performance. Some may find it pricey but the difference it makes to your room is well worth the added cost. Winix WAC9500 removes any micro-dust, smook, soot, mold spores and pollen. It is the ultimate air purifier with a latest PlasmaWave technology.